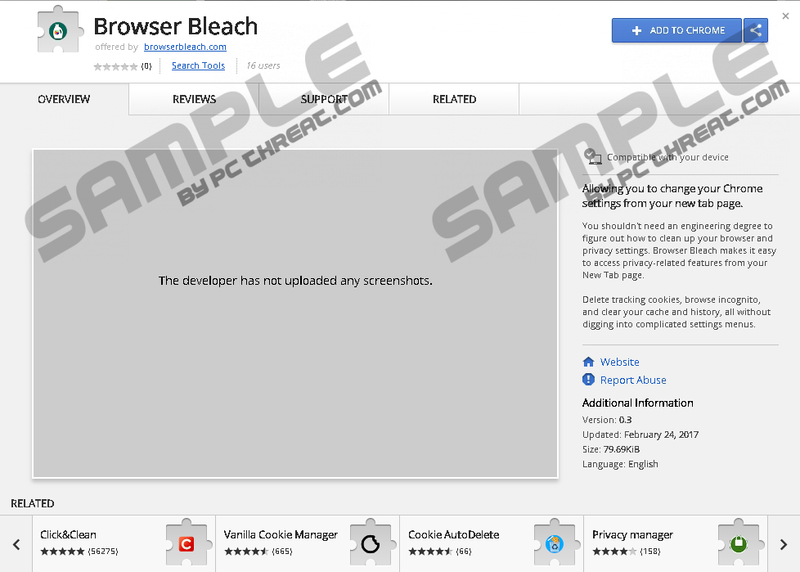 Browser Bleach is a browser extension that allows you to make changes on the Chrome browser without having to navigate to the settings manager. The extension alters new tabs so that the features it offers are just a click away. Browser Bleach enables you to clean tracking cookies, open a new browser window in incognito, clear the browser's cache, and delete browsing history. If you do not find this type of enhancement appealing, do not hesitate to remove Browser Bleach. The extension Brower Bleach is categorized as a potentially unwanted program (PUP), and soon you will find out why it is worth paying more attention to software installation. Additionally, your IP address, the version of the browser, geographical location, and other Internet usage-related details are also recorded by Browser Bleach. Such information is usually used to produce statistics that would help developers understand what type of people are interested in a particular browser extension and what their browsing behavior is. Unfortunately, virtually all browser extensions work in more or less the same way, so you should choose extensions for your Google Chrome carefully if you do not want to be analysed by some unknown and dubious third parties. Every new tab of Browser Bleach is powered by the Yahoo search. If you want to use this search engine as your default search tool, remove Browser Bleach and set the engine as the default one. There is no need to have browserbreach.com between you and the Yahoo engine, the results of which might be sligtly affected by Browser Bleach. The longer you keep Browser Blearch on the browser, the more information about you is collected by this service. Moreover, if the extension has just been installed without your approval, that suggests that this extension might have been attached to the program you have installed. Freeware is distributed in such a way so that various programs reach as many PC users as possible. Because of this distribution method, you should choose software wisely and only from trusted websites. Bear in mind that the Chrome Web Store is not the store that offers you browser apps only of the best quality. This freeware website has many free applications, some of which are regarded as PUPs. You install applications at your own risks, so it is worth having some assistance in identifying so-called potentially unwanted programs. A reputable malware and spyware removal program running on your PC will surely help you save your nerves and time. Consider implementing one so that you can connect to the Internet without the fear of getting the PC infected. Below you will find a removal guide that should help you get rid of Browser Bleach. Please note that removing the extension through the extension manager may be insufficient; hence, some additional steps might need to be taken. If you do not want to remove Browser Bleach yourself, get a program that will do it for you in no time. Click the three-dot icon in the top-right corner of the browser. Close the browser and open it again to see if the tabs are still affected. Quick & tested solution for Browser Bleach removal.